Citrine I have discovered is the gemstone for November. The name comes from the French word for “lemon” and describes some of the shades this stone comes in. It is a member of the quartz family and its color varies from a lemony yellow to a rich orangey brown. This coloration in Citrine comes about from the presence of iron. Citrine is also known as the Success Stone or Merchant’s Stone. It is said to promote and manifest success and abundance. It said to help promote business if put into the cash box. It also promotes generosity and prosperity. It is a happy stone and has been linked to the sun. It can bring happiness to the person who wears it. 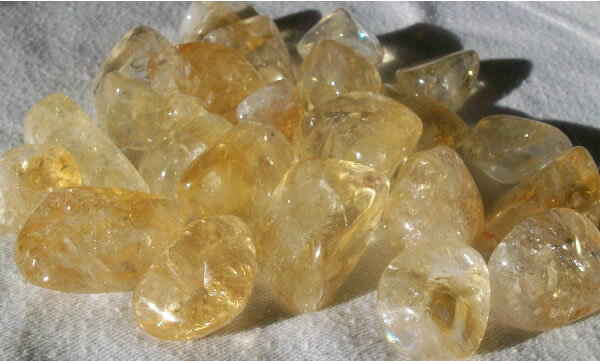 Citrine is a solar plexus chakra stone and can be used to increase personal power and energy. It can be used to combat negative energy and clear unwanted energy from your living space, office or outdoors. It can also bring hope and optimism. It also enhances mental clarity, confidence and will power. I also wanted to share a bit of my background and where I come from with stones. I took an intensive class at the South East Women’s Herbal Conference last month on Stones and Crystals which was pretty interesting. The instructor had started off stating that you need to keep an open mind. She talked about how it is was discovered that quartz can hold data and transmit data and this was the basis for using quartz in the first radios. Computers used quartz crystals and silicon valley grows crystals for our present day computers. OK I thought well and good, She also spoke how it is being discovered that our brain is a kind of liquid crystal and our DNA is also as it has a crystalline structure. This I had not heard and would need to do more research about these ideas. But this does note seem as far- fetched to my ears as I have heard of the work of Dr. Masaru Emoto and the Mystery of Water. He is a scientist and has researched how water can physically show through its frozen crystals the effects of words and feeling. We are about 75% water and I believe that our thoughts can greatly affect us but that is for another discussion. For me, if we have this liquid crystal in our bodies, brain and even down to our DNA and stones are crystalline in structure also that we may share some commonality with, is it such a stretch to believe that maybe we can have some effect on each other in some small ways? The Top Health Benefits of Eating Soup?